15/6/09 – Heritage – Paris - Another Parisian landmark will soon disappear. The Hôtel Reichenbach in the 16th arrondissement, a showcase of Art Déco by the architect Jean-Charles Moreux, with some of its furniture held at the Musée des Arts Décoratifs, is undergoing demolition (ill.). The permit was issued last 10 February (see article, in French). Despite efforts by the Commission du Vieux Paris and several press articles denouncing this act of vandalism, despite the last minute, and insufficient, move by an association for defense of patrimony which appealed for a legal, non-suspensive decision the Ministry of Culture did not lift a finger to save it. Yet it had a barrage of legal means at its disposal. 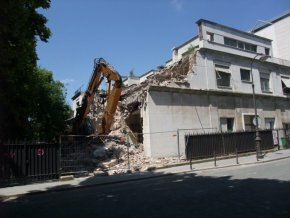 Should one really blame the Embassy of Saudi Arabia, which owns the building, for destroying it when those in charge of protecting France’s heritage turn their heads ? Unless, of course, nothing was done so as not to upset that country. In any case, Christine Albanel is responsible for this scandalous matter. Let us remember that she had threatened to resign if the HADOPI law was not voted through by the Parliament. Her priorities seem to be obvious.